This month we celebrate Men’s Health Week (9 – 15 June) and our focus is on the wonderful contribution that men make to daily life. It’s also a great opportunity to reflect on the role good health (in all its aspects) can play on one’s quality of life and how the benefits flow onto family, friends and communities. Sutherland Shire Libraries support men and boys living well with the following online resource. Consumer Health Complete is your one-stop shop on most matters relating to health and wellbeing. 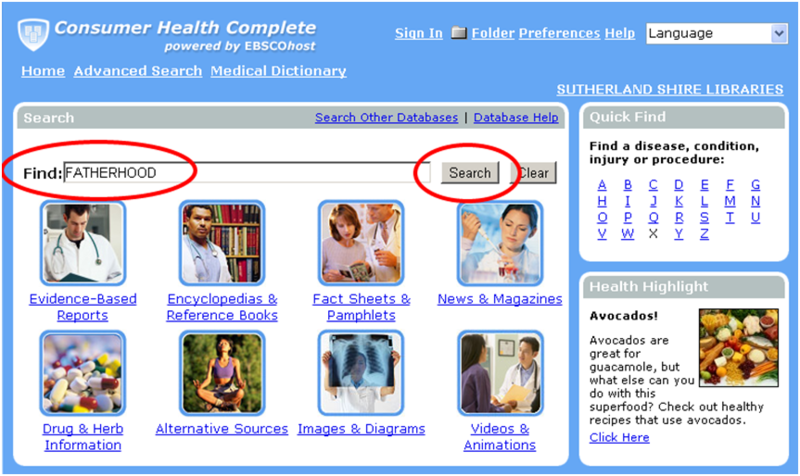 This resource offers a comprehensive collection of quality, up-to-date consumer health information in plain English. It’s available to Sutherland Shire Libraries members through the libraries’ website using your library card barcode number to gain access. Why not start with a Basic Search? Just click on the Home tab, type your terms into the Find box and hit Search. Results will be retrieved from a wide range of sources including encyclopaedias, reference books, journals, magazines, pamphlets, videos and images. Prefer to refine your searching? 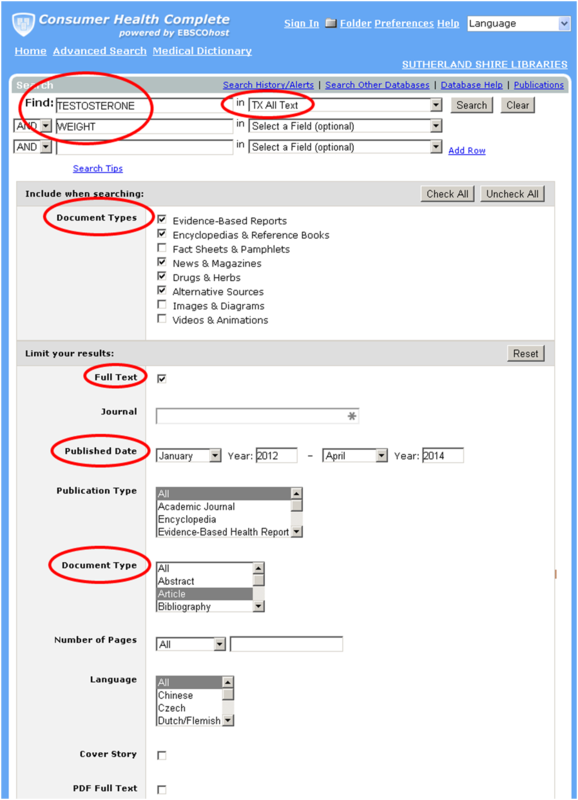 The Advanced Search screen allows you to select relevant document types and apply limiters to your results such as full-text, date range and more. 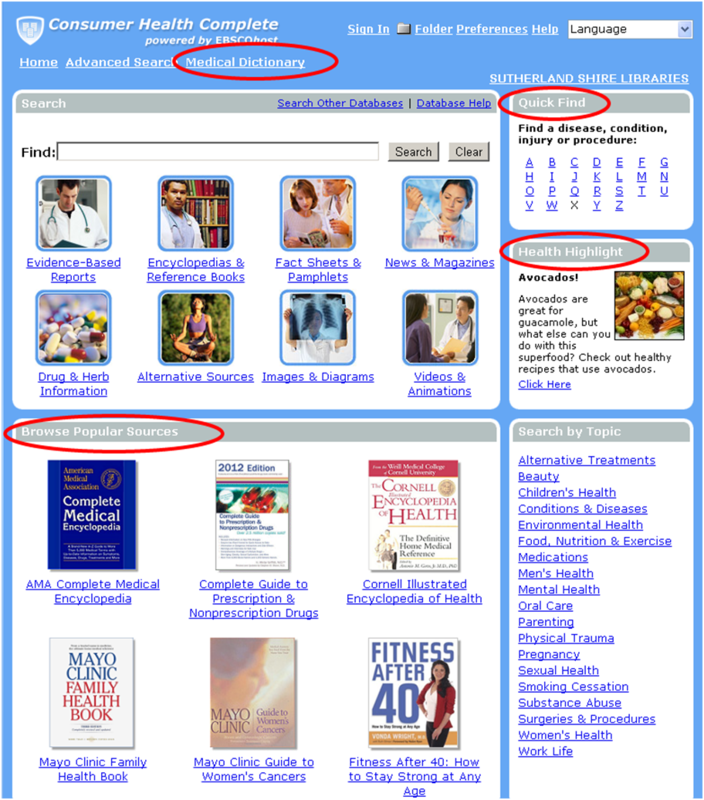 • Quick Find - easy access to information on common diseases, conditions, injuries and procedures. • Browse Popular Sources – a selection of reference books and encyclopaedias just a click away. • Health Highlight - current medical information on a variety of popular health topics. • Medical Dictionary - Merriam-Webster’s Medical Desk Dictionary at your fingertips. • The option to print, email or save your search results to a personal folder. • Set up alerts to receive the latest issue of a particular journal or be notified when a new article on a topic of interest is available. • Online tutorial demonstrates database features. With topics including men’s health, aging, cancer, diabetes, drugs and alcohol, nutrition, diet, women and children’s health, fitness and more, this resource has something to offer everyone. Its well-rounded approach encompasses mainstream, holistic, complementary and integrated perspectives. Good health starts here. Contact your Library for further information and start searching today!